Opting for the Unknown Bob Chandler ’92 charts his own course as co-owner of omnichannel retailer Tactics. When faced with the decision of following a traditional path or trying something unknown, Bob Chandler ’92 has opted for the unknown. It started when he left his small hometown in Kansas to attend boarding school in Colorado. Then, at Washington and Lee, he designed his own independent major, combining courses in psychology and philosophy to study cognitive science. The path continued in his professional life, when he joined forces with several friends to create an online company to sell snowboards. The idea for the company, first called Snowtraders.com, originated in 1999 with a group of six friends who knew each other through recreational soccer and law school. They aimed to tap into the dot-com boom and had only the modest goal of making enough money to pay for an annual snowboarding trip. The first warehouse was a garage, and the founders shared the duties of answering the phone, responding to customer emails and packing boxes for shipment. Even though it was a side business, “We cared deeply about our customer’s experience, which is still our primary focus today,” said Chandler. 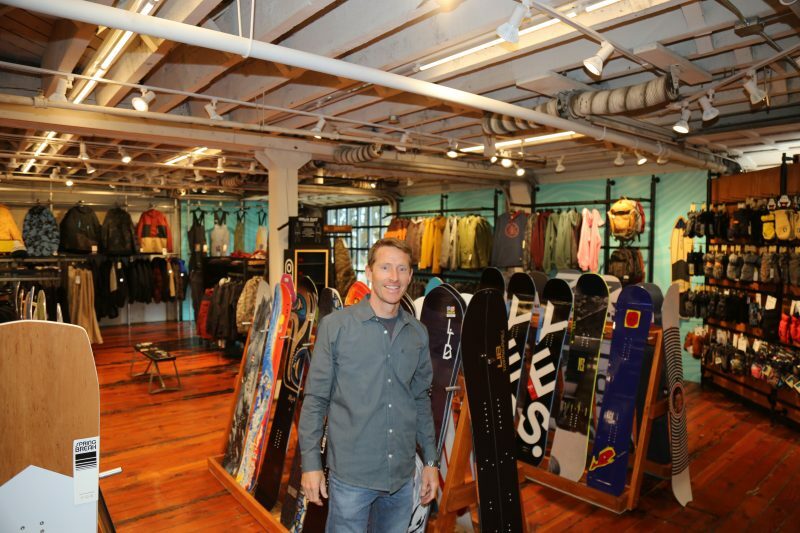 After the first winter, when sales of snowboards naturally declined, the partners realized that if the company was going to survive, it needed more than just part-time, unpaid founders. Co-founder Matt Patton spoke up first, saying he was going to quit his job as an attorney and work full time for the new company. “That was the extra push I needed to jump in with both feet,” said Chandler. Another founder, a professional engineer, did the same, and the trio moved quickly to reformulate the business plan in early 2000. They raised a modest amount of money from a few local angel investors and moved out of the garage into a “funky building on the wrong side of the tracks.” The company weathered the dot-com bust and in 2001, emerged with a new name (Tactics), a new business plan and fewer partners — eventually only Chandler and Patton remained from the original six. To balance out snowboarding’s seasonality, they added skateboarding, surfing, footwear, apparel and accessories to their offerings. Although the company has remained primarily online, the partners opened a retail store in Eugene, Oregon, in 2000 and recently launched another in Bend. The stores “provide a rooted identity and distinguish us from most of our large competitors. That matters to loyal customers.” Tactics also distinguishes itself by staying specialized, with a “high level of expertise, curation, selection, and support,” he said. Today, Chandler and Patton share CEO duties and maintain joint oversight of marketing and design. Chandler serves as CFO and oversees warehouse operations and customer service. Patton oversees buying, merchandising, and brick and mortar operations. A junior business partner serves as CTO, overseeing programming and technology. “We have been fortunate that the three of us get along so well and bring a diversity of perspectives and strengths,” said Chandler. Chandler’s route to entrepreneurship took him around the country. After graduating from W&L, he went to Washington, D.C., and considered working on Capitol Hill. Eventually, he took a job as a research analyst with Cambridge Associates. Then he transferred to a position with Arthur Anderson’s real estate consulting group, where he worked with a number of other W&L alumni. In early 1996, he moved to Oregon and volunteered for several environmental organizations. When he decided to go to law school, “I knew I wanted to be west of Kansas.” He settled on University of Oregon’s law school for its location and strong environmental program. His interest in environment was first honed in Professor Boggs’ course on Ethics and the Environment and his participation in the Outing Club, which encouraged students to “get outside and embrace environmental responsibility,” including the early recycling efforts at the university. Also challenging Chandler in several courses was Ramsey Martin, professor of philosophy. “Both professors elegantly introduced so many new challenging concepts and ideas — exactly the type of experience young minds need in a liberal arts education,” said Chandler. Chandler said there are still things the partners want to do with Tactics, such as offering significantly more private-label products and opening more retail stores. He also wants the company to continue to use its influence to make the world a better place. Tactics has a long track record of community involvement and direct support of charitable organizations, particularly those that focus on environmental advocacy and youth services.